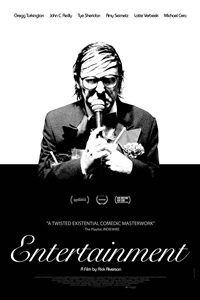 Rick Alverson’s Entertainment not only elicits the same kind of uncomfortable laughter fans of comedian Gregg Turkington’s alter ego Neil Hamburger have long grown accustomed to, it does so in understated and sublimely subversive cinematic terms. Starting Friday, you have a week to see it at the Digital Gym. Scott Marks: The film is being sold as a drama. How do you account for my frequent bursts of laughter throughout? Rick Alverson (laughing): It’s built as a drama, but I understand if individuals have access to reading it comedically at times. For a larger audience — which there may or may not be — it’s also designed to be read as a desperate tale of frayed identity. We tested it, and I became interested in the way that audiences were digesting it, if it was accomplishing the right balance of attraction and repulsion. The majority of the people hadn’t heard of Neil Hamburger, which is fine and great because it’s not a promotional vehicle for that persona. It’s its own thing. They read things as tragic that people who have access to a particular brand of humor find cathartic. SM: How difficult was it to get this script funded? RA: Fairly difficult. That having been said, we did finance it, so it’s certainly not impossible (laughing). It works against the grain for the economic formula for commercial fare in American cinema, insofar as it’s flirting with and subverting a lot of conventions. That’s the form of the thing — and also its real value, if it has any. When you subvert the formulas that are tried and true by flipping over the table people sit at waiting for their meal, you have to find the few brave souls willing to throw their money in the pot, which we did. SM: There have been a lot of bad movies made about standup comics. For every King of Comedy and Looking for Comedy in the Muslim World, there are dozens of wretched wannabes like Jo Jo Dancer, Your Life Is Calling, Punch Line, Mr. Saturday Night, and Funny People. What was it about Gregg Turkington’s Neil Hamburger character that moved you to fashion a film around him? RA: The Hamburger character is grafted intact onto the stage persona you see in the film. The offstage persona, which occupies 95 percent of the movie, is a collaboration between Gregg and I, a creation in the context of the film. We share a lot of the same proclivities, and interests, and restlessness, and discomfort — whether it’s the comedic ends for him or dramatic ends for me. The character is something he’s built for 20 years, and at this point has become an increasingly antiquated formal construction. There’s this sort of interest in the slightly autobiographical, totally “honest” comedy. When I saw him perform, besides all the formal traits — the cadences, the repetition, the construction of that character — aside from being funny, the stage performances are fascinating for me. There is this “man out of time” quality to it, because there’s an increasing disinterest in form. Everything is content-driven and disposable. I saw that in his character. 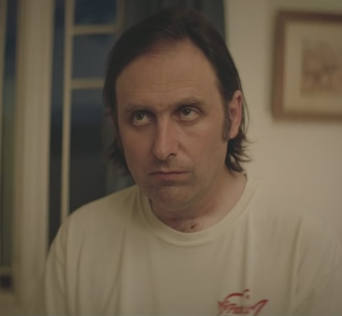 The bitterness of the character is maybe a concern and lament of Gregg Turkington as the author of that stand-up character. It certainly is in the movie, too. The movie is a pretty formal construction that over the course of its 100 minutes becomes more preoccupied with form than content. SM: From the moment the light hits the screen, you lock us into this man’s universe with a rock steady point-of-view. As much as I detest mainstream cinema’s unerringly sentimental depiction of the mentally challenged, I’m always up for a slow descent into madness. SM: There were certain moments where you lost me, but to your credit as a filmmaker, I never lost interest. When asked the best way to understand the meaning of Un Chien Andalou, Luis Bunuel said something to the effect of, “The only method of investigation would be, perhaps, psychoanalysis.” Can the same be said of Entertainment? RA (laughing): I’m not into psychoanalysis. There is too much of the intellect at play in everything we do. The suggestion that the thing lost you at certain times intellectually but you didn’t lose interest — to me, that’s a huge compliment. The thing is engineered to bring the arbiter of the intellect that very conveniently unpacks and orders experience, particularly in narrative cinema, to a point where people walk out feeling that they’ve digested something. Or at least believe that they have. That we haven’t been altered physiologically, psychologically, and that we haven’t been touched physically. It’s a very convenient, efficient, functional way of providing an entirely disposable experience. The interests of this movie are to disrupt that. I do believe that we can be engaged and that our curiosity can be handled tactily and more immediately and experientially than just that simple unpacking of intellectual information. My objective is to disrupt that, but provide a real, formal meaning that isn’t just a Freudian unpacking of symbolism. That’s what the whole experiment was about. Much more than comedy, certainly.